Like Microsoft, PC vendors have struggled to make a mark in the smartphone market. But with Windows 10 they are joining forces to give it another try with features like Continuum, which brings together PCs, smartphones and tablets. "We were very excited when we heard about the Continuum feature, and immediately went to work," said ST Liew, president of Acer's Smart Products business group. Ahead of the IFA trade show in Berlin, Acer gave a sneak peek of the Jade Primo, which looks just like a regular smartphone with a 5.5-inch full HD screen and a Qualcomm Snapdragon 808 under the hood. But the device can also be connected to a bigger screen (also with full HD resolution) wirelessly or with a USB-C cable, and use Contiuum to render a desktop user interface, according Liew. The goal is to start shipping the Primo before the end of the year, he said. 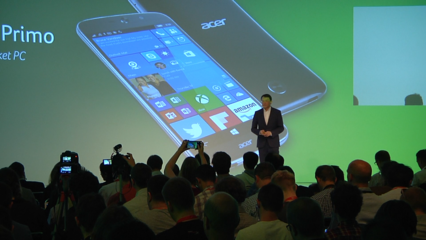 Before Acer can ship the phone, though, it will have to wait for the release of the smartphone version of Windows 10. Microsoft hasn't set a date for that yet, promising it only "in the fall." The Snapdragon 808 is a fine smartphone processor. It should have enough oomph to power a basic desktop, as well. The Primo will come with a docking station, keyboard and wireless mouse. It will also have a 21-megapixel camera on the back and an 8-megapixel camera on the front.